This is a Winchester model 69 it is a magizene fed bolt action .22 Made in USA, Stamped on the barrel it says Model 69- 22 short long and long rifle. I was told they stopped making these in the 1950's. When i got this model it was in pretty bad condition , stock damaged all over and pretty much no origional bleuing left. the rifle was completley stripped and cleaned re blued and stock sanded down and re vanished, the original finish of the stock was darker. 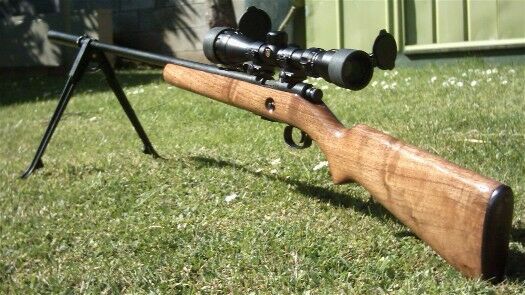 this rifle has had scope Blocks fitted to the top because back in the 50's they never thaught they would be fitted with a telescopic scope so there were no groves for fitting a scope, also the barrel has been threaded and a silencer attached. In the photo it has a ramline clip on bipod attached to the barrel.